Force’s 5" (127mm) square, 3/16" (5mm) thick post and dual strut extension make it a high-quality system that will stand up to even the toughest play. Post set features the same Tubular H-Frame and direct goal attachment design featured on our top of the line adjustable post set. Backboard extends 4’ (123cm) in front of the post when set at 10’ (305cm). 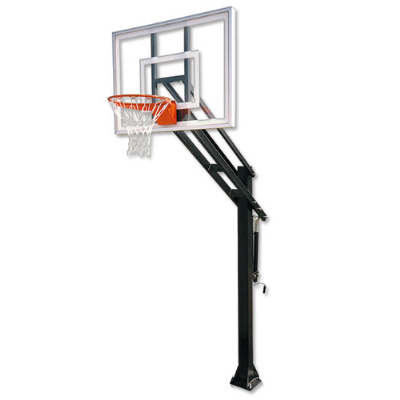 Crank style adjustment system with spring assist makes it easy for most people to adjust the goal to any height between 10’ (305cm) and 6’ 6" (198cm). Indicator shows the rim height. Post features welded steel bushings at all pivot points and a welded top cap to provide durability. Post and extension finished in durable black powder coat. Post set provided with 54" x 36" (137cm x 91cm) Acrylic Backboard and Outdoor Breakaway Goal.